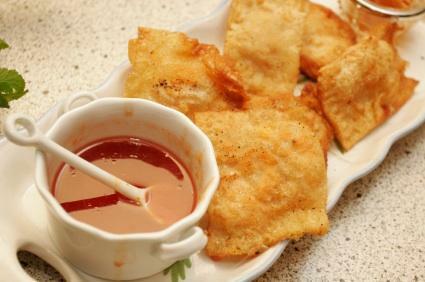 Crab cheese rangoon are one of the most popular items on American Asian restaurant menus. You may or may not be surprised to know that these little pouches of delicious, cheesy, crunchy goodness are not Asian at all. In fact, they are just as American as hamburgers and apple pie. By definition crab rangoon are dumplings filled with a mixture of cream cheese, crab meat, scallions and garlic. They are wrapped with a Chinese wonton skin, deep fried, and are served with Chinese mustard or a plum sauce for dipping. No one really knows where crab rangoon was first made, but legend has it that it was first listed on the menu of Trader Vic's in San Francisco around 1957. Trader Vic's claimed that these crispy appetizers were from a Burmese recipe. However, because cream cheese is a relatively non-existent foodstuff in Asian countries, it is more likely that the rangoon were invented at Trader Vic's. Creating crab rangoon at home is an incredibly easy, but time consuming endeavor. The ingredients are easy to find in most grocery stores: cream cheese, crab meat or imitation crab meat, garlic, soy sauce and wonton wrappers. The only ingredient that might be difficult to find is the wonton skins, which are little wrappers made of flour, eggs and water. They are very thin and pliable, so they wrap easily around a filling--almost like an Italian ravioli. Look for the thicker versions, which are more easily fried than the thinner ones. When working with wonton wrappers you will want to keep them moist with a damp towel over the top. Once you have filled your square with the crab/cheese mixture you will seal the wrapper together with a glue of cornstarch and water. If you can't find wonton wrappers you can always substitute egg roll skins or dumpling wrappers. In a pinch feel free to use pasta sheets, such as fresh lasagna noodles. Once you have the basics down you can then begin to play with different types of food origami, or the way you fold the wrappers together. This is just one of many different recipes you might find for crab rangoon. Combine the cream cheese and crab meat until well mixed. Add the soy sauce, black pepper, green onion and garlic and mix until combined. Unwrap the wonton skins and lay out one wrapper so it forms two triangles. Wet the edges with a mixture of cornstarch and water. Place one teaspoon of the crab filling in the middle of the wrapper and spread towards the left and right points so it forms a rectangular shape. Fold the edges together to make a triangle, then wet the edges again with the cornstarch/water mixture and press to seal. As you are making the rest of the rangoon, keep the finished versions under a wet paper towel so the wrappers don't dry out. Heat a wok or a saucepan filled about four inches with oil for deep frying. When the oil is between 360 and 375 degrees F., add the crab rangoon two or three at a time and deep fry them until they are golden brown. Remove when done and drain on a plate covered with a few paper towels. Serve hot with a Chinese mustard sauce or a sweet plum sauce. Trader Vic's is an American icon. It was started by Victor J. "Trader Vic" Bergeron who was a restaurant owner in Oakland. After an extensive trip to the South Seas Bergeron opened Trader Vic's as a tropical retreat that was replete with Island-style artifacts from his travels and menu items that brought the flavors of Southeast Asia to America. In addition to the Crab Rangoon, Trader Vic's is also well known for originating the Mai Tai. Today there are 25 Trader Vic's Polynesian-style restaurants throughout the world.